I have always been fascinated by Marianas trench which is the deepest place on Earth. It is 200 kilometres to the east of the Mariana Islands in the Pacific Ocean close to the Philippines. It is 10,000 metres deep which is much deeper than the Earth’s deepest canyon which is the Cotohuasi Canyon in Peru. If you had to drop Mount Everest in Marinas Trench there would be more than a kilometre of space left to go to the surface. Here is a great video of James Cameron in the Marianas Trench and also a really interesting diagram which shows just how deep it really is. The BBC reported a famous feature of Mount Everest has collapsed, making the world’s highest peak more dangerous to climbers. Mountaineers said the Hillary Step may have fallen after Nepal’s 2015 earthquake. The almost vertical 12m rocky outcrop stood on the mountain’s southeast ridge, and was the last challenge before the summit. It was named after Sir Edmund Hillary, the famous New Zealand mountaineer and explorer who was the first to scale it in 1953. British mountaineer Tim Mosedale said the Step had collapsed after reaching the summit on 16 May this year. he said the loss of the Step was “the end of an era”. “It is associated with the history of Everest, and it is a great shame a piece of mountaineering folklore has disappeared,” Mosedale said. Mountaineers claim the snow-covered slope will be much easier to climb than the rock-face. Wired magazine has a great summary of recent Volcanic activity. On 13th and 18th April, Poas in Costa Rica had its largest eruption in years called a “phreatic” eruption caused by water in a lake heating into steam. It has a dramatic looking plume that reached one kilometer high. There was plenty of ash and boulders 2 meters wide were thrown from the lake vent. You can see great video of the eruption here. In Sicily, Mount Etna has also been erupting in April, with new lava flows. Nishinoshima close to Tokyo, also erupted recently, making new lava flows into the sea. This is the first eruption at Nishinoshima since November 2015 after erupting over 100,000 cubic meters (3.5 million cubic feet) of lava after two years it has finally stopped. During my long weekend I traveled to a place in the mountains called Bainskloof. It is beautiful area with lovely hiking routes. But the history behind the area is just as amazing. The man who made the road through the mountain pass was named William Bains who had made some of the most famous roads in the Western Cape. Bains was from Scotland and was born in 1797. He was a keen geologist and fossil collector. He was most famous for his discovery of what became known as the Blinkwater monster. It was later described as a Pareiasaurus serridens or a mammal-like reptile. Road building is a good profession for an amateur geologist and fossil hunter because it will give you opportunities to find samples. The geology of the Bainskloofs pass is mainly very old eroded folded igneous rock. The Economist says that by 2040, the Arctic sea ice will have melted from climate change. In the past thirty years the surface has shrunk by over half, and its volumes fallen by three quarters. this will create a large sea which some people may think would be an advantage for shipping, but it will mainly affect the world in a negative way. The interesting thing is that the sea water is darker than the ice therefore it heats faster and absorbs more heat than reflecting it back into space. This is why the Arctic is heating faster than the rest of the world and therefore creating climate change. Also, the worlds winds are created by the the temperature difference between the poles and the tropics. if the Arctic heats faster wind speeds will become slower this will effect things like the jet stream and ocean currents. The Guardian reported that the Slims river in Canada disappeared in four days as ice melt from the glacier changed the direction of its flow into another watercourse. Now, meltwater from the Kaskawulsh glacier is carried away from the Slims river and toward the Kaskawulsh river. The disappearance of the Slims river, which was up to 150 metres at its widest point, is what scientists are calling “river piracy”, where the flow of one river is diverted into another. For hundreds of years, the Slims river carried meltwater north from the Kaskawulsh glacier in Canada’s Yukon territory into the Kluane river, then into the Yukon river towards the Bering Sea. But in 2016, a lot of glacier ice melted so the drainage was tipped to the Alsek River, taking the meltwater to the Gulf of Alaska. The scientists used drones to investigate what was happening. “We found the Slims riverbed was more or less dry,” said James Best, a geologist at the University of Illinois. The landscape changed. Where the Slims used to flow, Dall sheep from Kluane National Park are now eating the fresh vegetation, in an area where they can be legally hunted. The air is now often turned into a dusty haze as winds make dust clouds out of the exposed riverbed. Fish populations are also changing. Analysis shows that the changes can probably be attributed to climate change. The Yukon region is sparsely inhabited, but future river piracy could have huge effects on towns, villages and ecosystems. 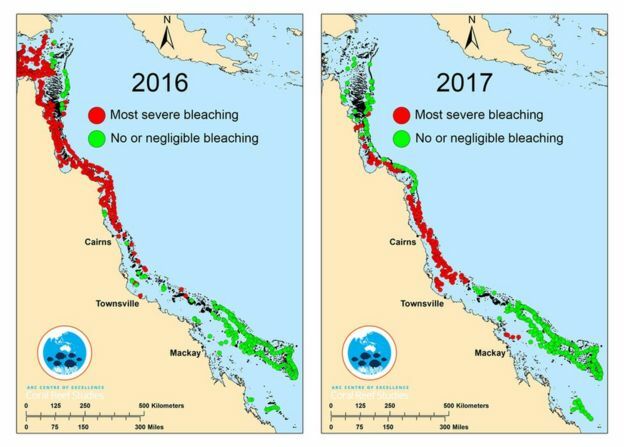 The BBC reported unheard of levels of coral bleaching in continuous years that has destroyed two thirds of Australia’s Great Barrier Reef. Bleaching is loss of algae and has affected a 1,500km (900 miles) of the reef, according to scientists. Prof Terry Hughes and expert from James Cook University, said governments must address climate change to prevent bleaching. He said “Since 1998, we have seen four of these events and the gap between them has varied substantially, but this is the shortest gap we have seen”. I chose this article because I find plate tectonics interesting and it is amazing to think that the ground below us is constantly moving. I got this info from a website called Phys org and it is talking about how Geophysicists in the Earth-Life Science Institute at the Tokyo Institute of Technology say they have found a deep mantle conveyor belt that may have been active in the Earth since its formation around 4.5 billion years ago. Most geological activities are done by plate tectonics which is where plates collide, pull apart and go on top of each other. Beneath the tectonic plates is the 3000km thick mantle where molten rock is circulated under high pressure and temperature and is called convection currents. This process tries to get the heat out of the earth’s interior and the action is similar to the motion of water boiling in a pot. Convection currents also control the tectonic plates which are near to the surface. After a long period of time they subside because one plate slides on top of another and sinks to great depths. This new model described by these Japanese scientists has given geophysicists a new way to understand processes that drive our planet. The BBC says that the first famine in six years has been declared in parts of South Sudan. The government and the United Nations say that about 100,000 people are facing starvation, and a million more on the edge of famine. Civil war and economic problems together with a drought have been blamed as the causes of the famine. There have been warnings of famine in Yemen, Somalia and north-eastern Nigeria, but South Sudan is the first to declare a famine this year. The famine is in Unity State which is in northern South Sudan (see map), humanitarian groups warned that the situation could spread if urgent food is not delivered soon. Aid agencies, including the UN World Food Programme (WFP) and the Children’s Fund UNICEF said 4.9 million people, more than 40% of South Sudan’s population, are in need of food. A famine does not mean that the UN or particular countries have to do anything, but it focuses attention on the problem. The UN report said that an increase in humanitarian assistance was needed in order to prevent the famine from spreading. Joyce Luma, Head of the World Food Programme in South Sudan, said that the famine was “man-made” after three years of conflict and reduced production of crops. The BBC reported that the 240 more pilot whales have been stranded on a remote beach in New Zealand. On Saturday, volunteers refloated about 100 of the 400 pilot whales that beached on Thursday. The whale stranding, at Farewell Spit at the top of the South Island, is one of the worst ever in New Zealand. It is not understood why whales beach. One theory is that they have been attacked by sharks and driven on to land, after bite marks were found on one of the dead whales. An expert from New Zealand’s department of conservation Herb Christophers said that the whales were trying to swim around South Island, but if their navigation had gone wrong they ended up on the beach.